Make a grand statement with GFRC Greek Corinthian columns from Stromberg; it’s a luxury that’s within reach. Corinthian, the most ornate of all Greek columns, has slender fluted columns and elaborate capitals (the topmost part of a column), and is decorated with acanthus leaves and scrolls. Notable examples of Greek Corinthian columns can be seen on the United States Capitol in Washington D.C., the Pantheon in Rome, and University College London. Stromberg will construct your GFRC (glass fiber reinforced concrete), Greek Corinthian column according to your exact specifications. They’re a leader in our industry and pioneered the use of the versatile material GFRC. You can choose plain or fluted Corinthian column shafts in whatever size, diameter or height you want. Stromberg uses molds to craft your column; your GFRC Greek Corinthian columns will be the perfect complement to your home or business. Stromberg Corinthian columns already grace mansions, palaces and government buildings, to name a few. 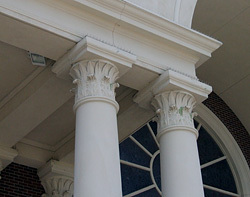 Stromberg has high standards in the production of your GFRC Corinthian column. They’ll provide you with custom caps that fit your style and décor; you’ll love the detail. These columns are a wise investment since you’ll be purchasing direct from the manufacturer. They use the latest technology and can handle any size project. Stromberg has great service and quality; 80% of their business is repeat business. Stromberg can also restore and renovate any Greek Corinthian columns with GFRC when replacement with the original material is impossible. They’ve worked on such projects for the federal government, museums, corporations and private individuals. With Stromberg’s commitment to quality, you can be assured your columns will virtually indistinguishable from the initial material. Choose GFRC wherever you need a light, strong, weather resistant material. GFRC is rust proof because it’s reinforced with glass fibers instead of steel. Glass fiber reinforced concrete is fire-retardant and acts like a thermal regulator when exposed to flame. GFRC is available with cast in integral colors and textures like limestone, precast and acid wash. The professionals at Stromberg Architectural Products will partner with you every step of the way to make your GFRC Greek Corinthian columns a reality. Stromberg is here to help with CAD details, design assistance and all specifications. Contact them today at (903) 454-0904 for your free custom quote, and put their 30 years of experience to work for you.